The Hidden Pearl, a tiny bar tucked behind a Brooklyn ramen shop, is a true hidden gem of New York City. Featuring a sleek design with cool shades of blue and white, this bar is known for its unique cocktail blends that combine delicious taste with a Japanese twist. 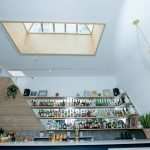 Visitors walk to the back of Wanpaku ramen restaurant and enter through a swinging door that reveals a tiny, Japanese-style speakeasy, designed by architect Arnold Cheung. 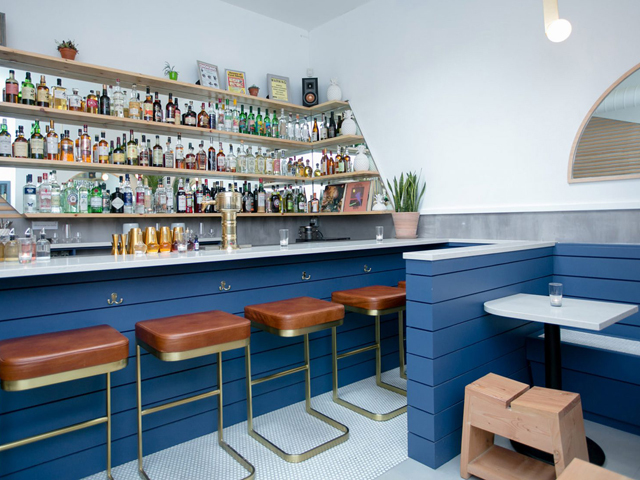 Cheung overhauled an already gutted, slender shop at 621 Manhattan Avenue to create both the Wanpaku restaurant and The Hidden Pearl in a separate space at the rear. 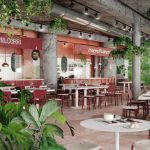 The venue is Cheung’s sixth eatery and third ramen restaurant in New York that he heads with partners Chatchai Huadwattana and Kanruthai Makmuang. 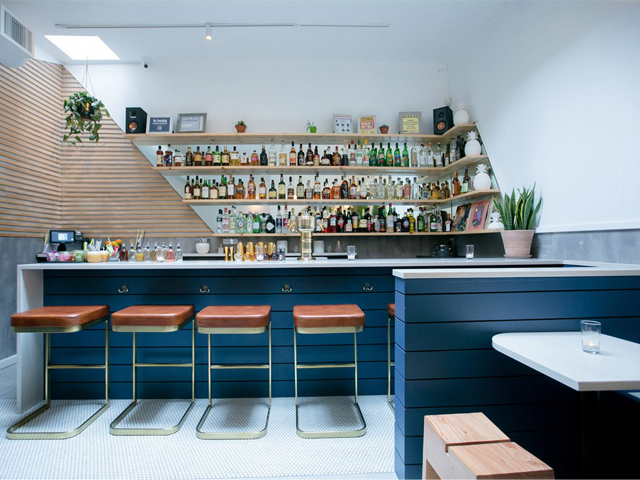 For this project, the group also teamed up with Leif Huckman, owner of Donna Cocktail Club in nearby Williamsburg, to run the accompanying bar. 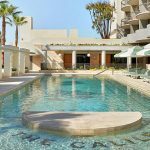 “We didn’t want to simply tack on a bar to the restaurant for customers to order drinks while they ate; the bar had to be a completely separate experience and destination for our customers,” Cheung said. 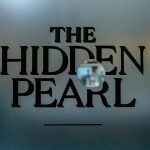 The Hidden Pearl serves drinks and light snacks that are “recognisably Japanese” as an alternative to the steaming hot ramen offered in the restaurant. “We knew of the struggles of operating a ramen restaurant in the summer months in New York City,” Cheung continued. 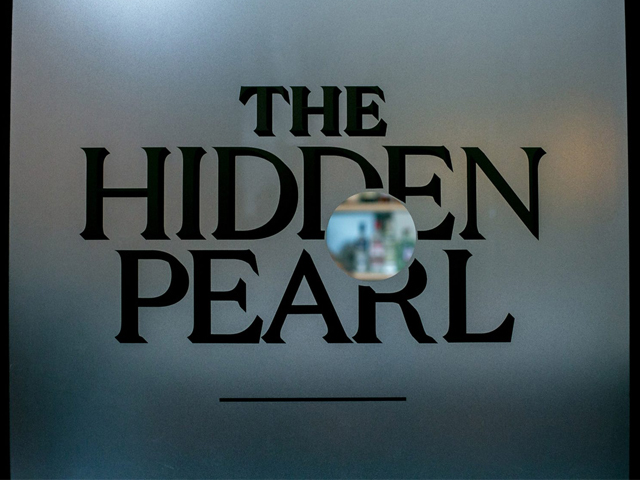 Billed as a speakeasy – the name given to the illicit establishments that sold alcohol during prohibition – The Hidden Pearl is accessed from the restaurant via a door fitted with transparent glass. Only a glimpse is offered through a clear glass circle that in the door, which imitates a pearl, until it swings opens. 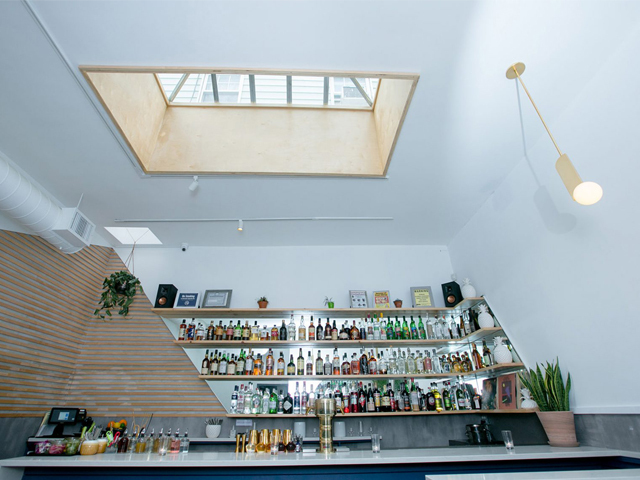 While speakeasies are typically dark spaces, a large skylight runs above The Hidden Pearl. This brings in plenty of natural light and creates a bright and airy space, complemented by the white walls. 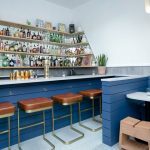 Blue-painted wooden panels cover the fronts of built-in benches and the bar, which is topped by a pale counter to match tables. Decorative details are offered by pearlescent circular patterns that cover the floor, benches and moon-shaped mirrors. Plants were added to accompany the bar’s menu of tropical cocktails with a Japanese edge. 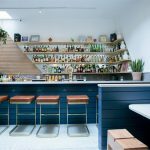 Slatted wooden panelling that lines one corner of the room and leather stools with golden bases are among the other bar features. 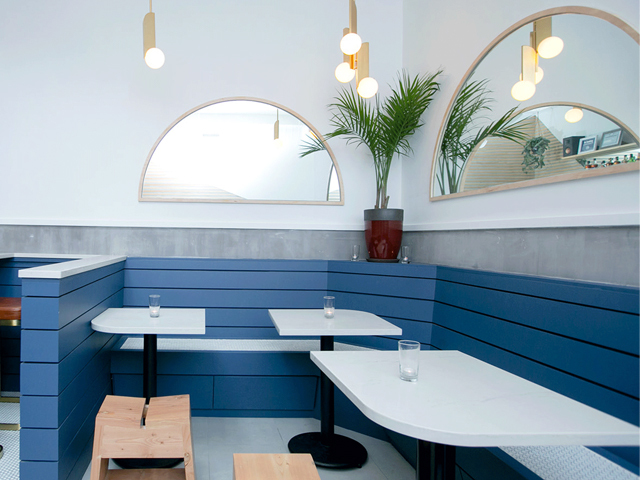 Cheung chose a more stripped-back aesthetic for Wanpaku. 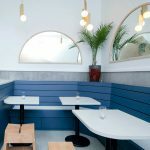 The restaurant features a mix of birch wood furniture, exposed concrete walls and golden chairs to “give the standard Japanese ramen shop a modernised feel”. There are also a number of sustainable design features. 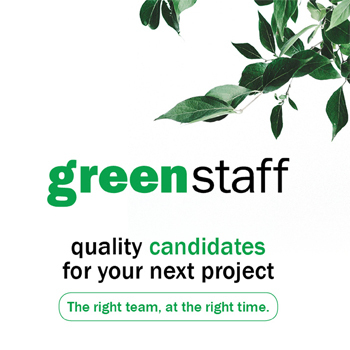 Table surfaces are made from recycled denim jeans, custom-made LED fixtures are installed and reusable metal straws are offered instead of plastic. “By choosing to go with a separate bar within the restaurant, we felt we could keep the focus and identity of Wanpaku on Japanese foods, while the bar could have its own identity and focus,” Cheung said. Located just north of Brooklyn’s well-known Williamsburg neighbourhood, Greenpoint is an industrial area that is growing increasingly trendy, and becoming a popular hub for eateries, bars and cafes. 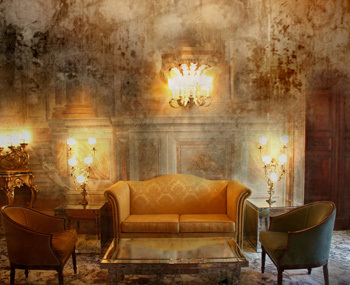 Photography by Phillip Van Nostrand.